Looking for the beginning? Start here. Our room is warm at night, so we’ve been opening the window. Lots of happy people talking and laughing on the sidewalk below, late into the evening; when there aren’t people audible, there are diesel pick-ups roaring, and motorcycles with their deafening blat-blat-blat. In the rare bits of quiet, I could hear frogs croaking in the pond in the wooded plaza. I rarely sleep well while traveling (who does? ), and couldn’t get to sleep with all that going on plus the noisy sheets. Yes, noisy sheets. We’ve all experienced them… crisp white sheets that, somehow, sound like rustling cornstalks every time you move. Clark is a restless sleeper, so there was a lot of rustling, usually — it seemed — right when I felt my eyelids starting to droop. Very frustrating. I suppose I should add that I’m a freak about noise, and always have been; I can’t work or read with music playing; as a kid Mom had to send me out of the house if she wanted to vacuum; I can hear a male passing gas on a different floor of the house, through two closed doors (it’s my superpower). I have trouble shutting noise out, and it doesn’t take much for me to be overwhelmed. So, cars and voices and rustling sheets while trying to fall asleep drive me insane. I really liked those frogs, though. When I could hear them. After Clark finished his online work in the morning, we hit the road. The goal today was Sonora, in the foothills of the Sierra Nevada mountains. We’d be staying with writer friend Melanie Jackson, her husband Brian, and Alpine the dog. Before getting too far out of town, however, we stopped at Cornerstone Gardens, which I’d read about online but no one in Sonoma seemed that excited about. 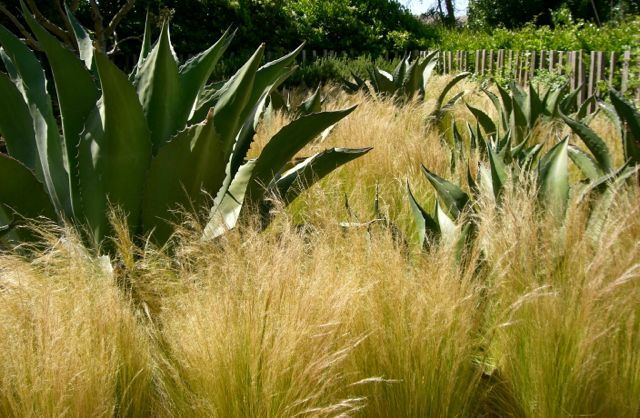 It’s a couple acres of display gardens, created by designers and landscape architects from around the world. Free admittance, plus some quirky shops to browse through. What’s not to like? 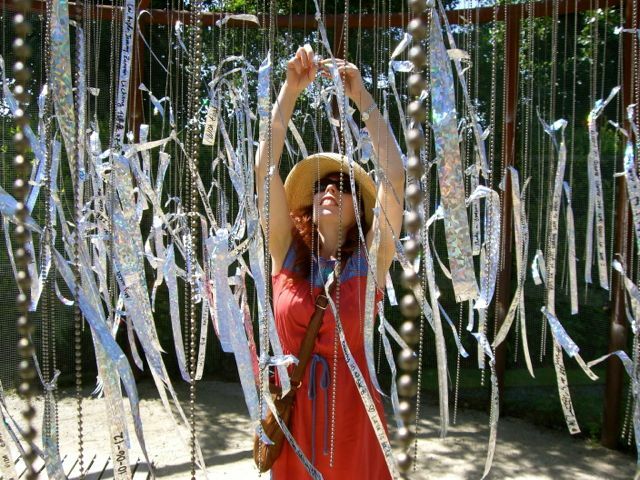 One display garden was more of an art installation, with rolls of glittery tape you could write on, then attach to hanging bead chains. 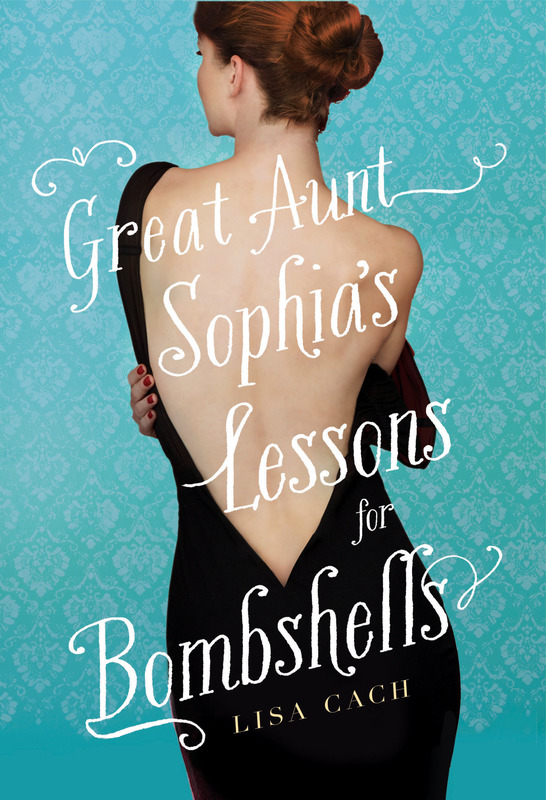 I made a wish that Great-Aunt Sophia’s Lessons for Bombshells would be a bestseller this summer, the hottest of hot summer beach reads. Woo hoo, work your magic, glittery tape! 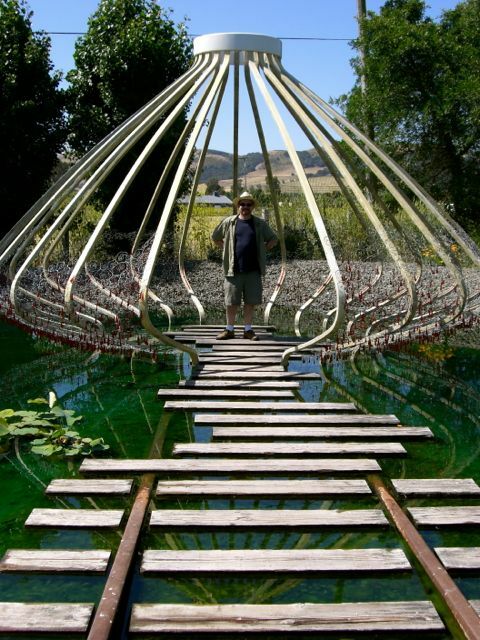 Some of the gardens were calm and pleasing; others were imaginative or just plain strange. 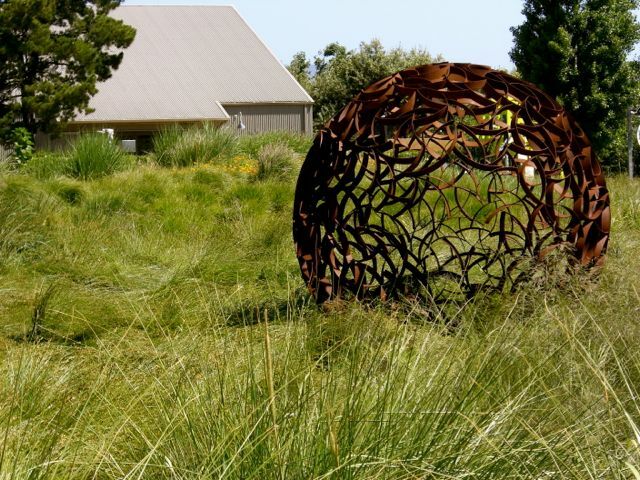 A big rusty ball sitting in the grass, rusting… I want one. 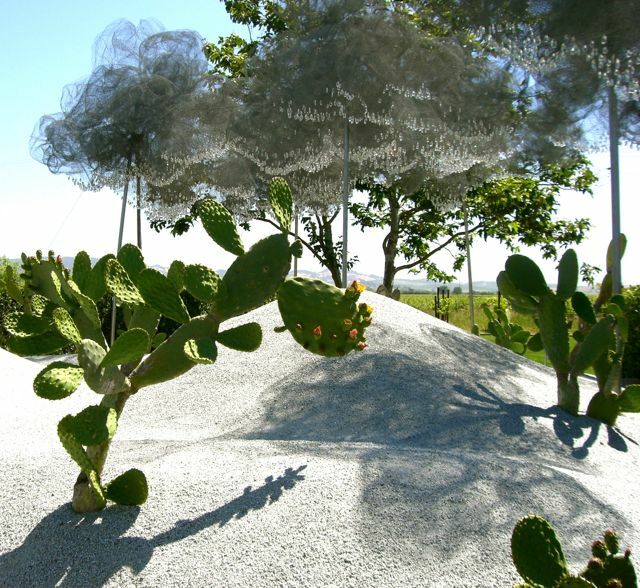 A surreal landscape, with super-cool wire clouds and crystal raindrops. Mm. 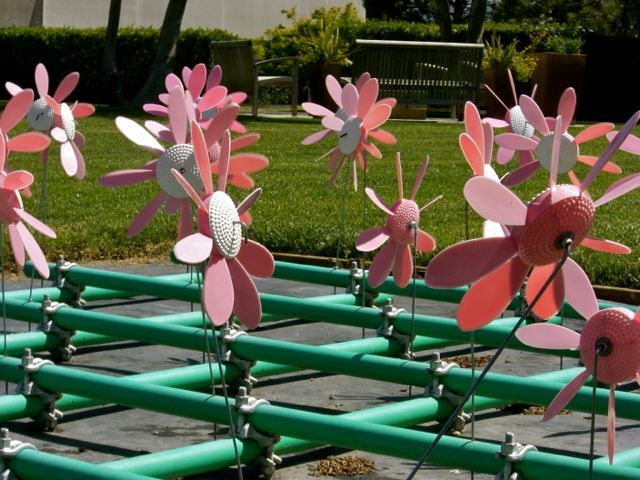 I’d like it better if they sprayed water as they spun. 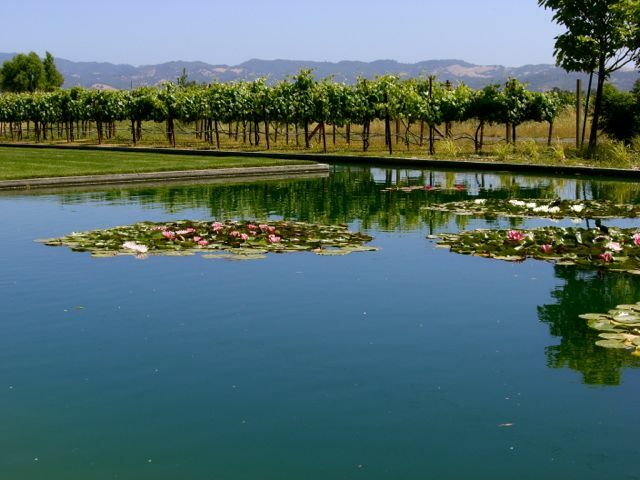 A pond edged by… a vineyard. What else, in Sonoma? 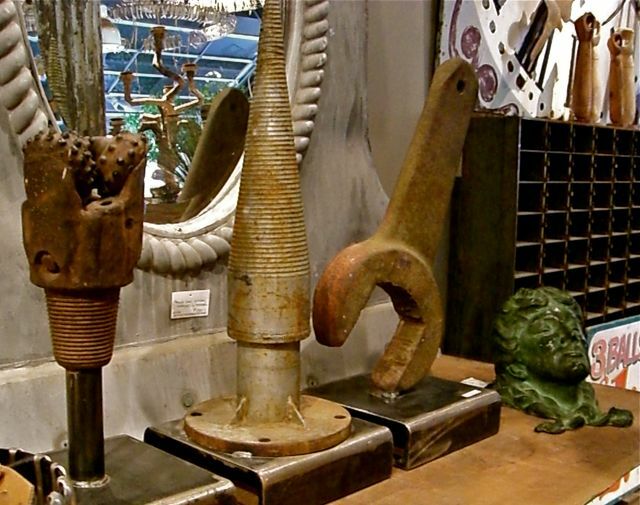 At a shop called Artefact, salvage items from around the world are re-purposed into art. We love love LOVE this type of place. So many creative ideas on display, that help you see the beauty in everyday objects, both natural and manmade. 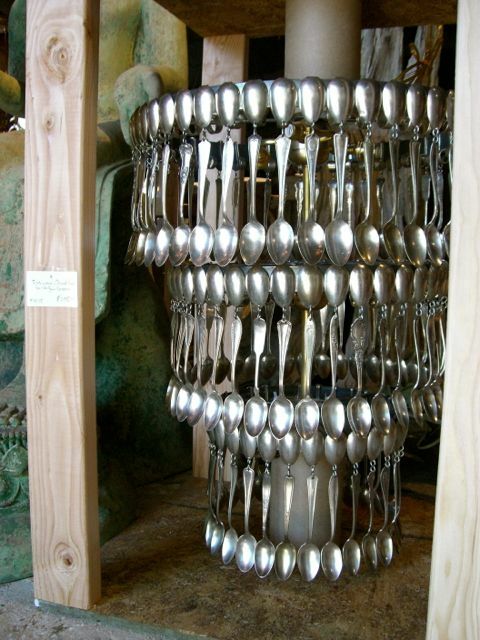 Spoon chandelier. I saw a couple smaller ones in Sonoma; bet they got them here. 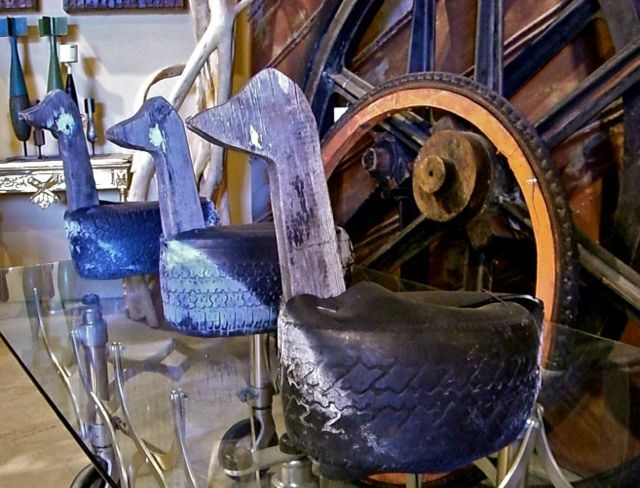 Tires turned into geese; very clever. 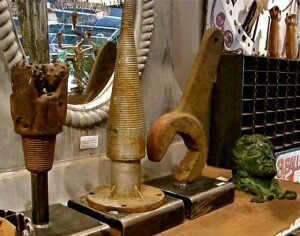 Big tools welded onto steel platforms. Voila, art! 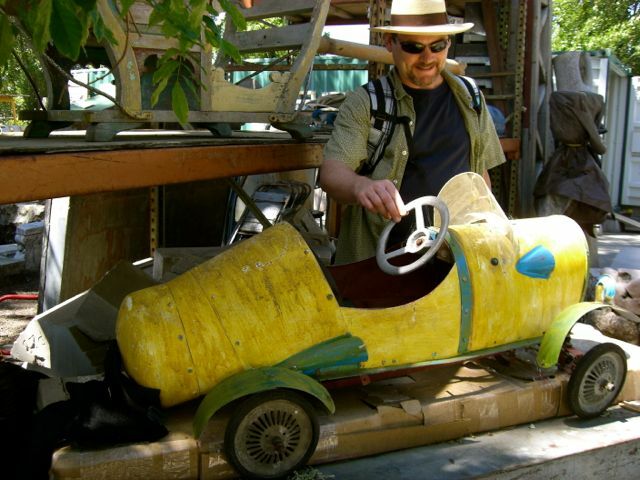 Clark finds his dream car. 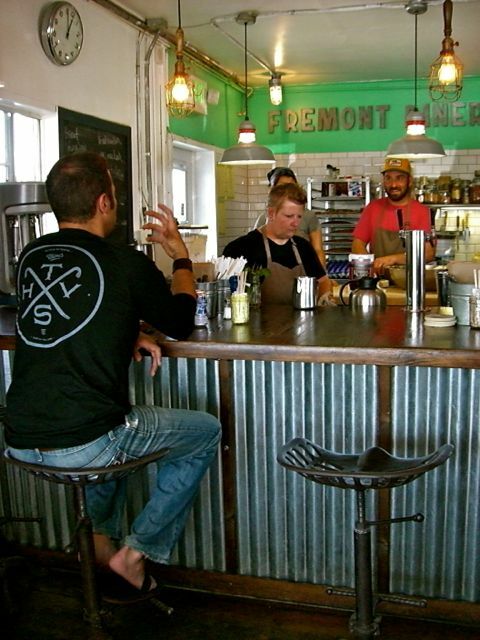 By now it was lunchtime, so we took the advice of a friend back home and stopped at the Fremont Diner — as it says on the menu, it’s ‘serious Southern food’ with a ‘distinct local sensibility.’ It was a cute place along Hwy 12 between Sonoma and Napa, with very good food. 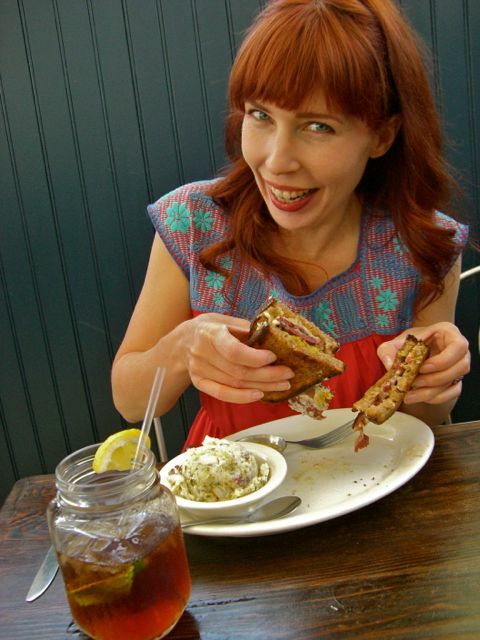 I try Reubens everywhere we go, to see how they compare to the Reuben at our home pub in Seattle, the 74th Street Alehouse. This Reuben was pretty darn good; the bread, a sourdough rye, was definitely better than I’m used to. Interior of the diner, with the de rigueur tractor seat stools. And then back on the road we go. The forecast for the day was 95 degrees, so eventually we had to roll up our windows and turn on the air conditioning. The road got boring, too, skirting near Sacramento etc., so we finally hauled out one of the many audio books I’d packed for the trip. Our choice: David Sedaris’s Dress Your Family in Corduroy and Denim. One needs humor if one is driving on a tiresome road for a handful of hours in 90+ degree heat. A quick snapshot out the window while going over a bridge. I have no idea what river that is. 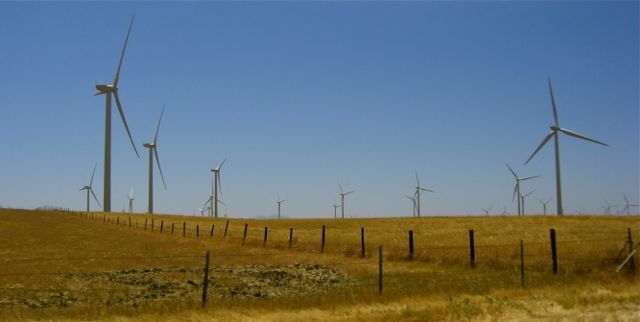 Wind power and dry grass. There were picturesque black cattle grazing around, too, but I never managed to get a decent photo. Mid-afternoon we arrived in Sonora, and emerged from the cool car into a day that had reached 107 degrees. Aie yai! 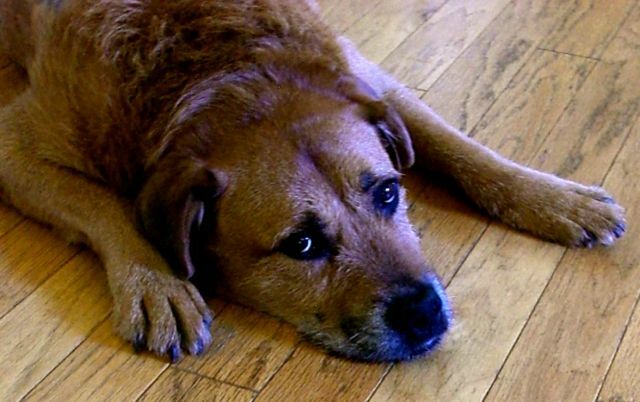 Brian was sweating, Melanie was half-wilted, and Alpine the dog lay on the floor by the fan, panting and barely managing a thump of the tail in greeting. Poor Alpine. Since I’d last seen her, she’d developed a skin condition that required shaving a huge rectangle of fur off her back, making it look like someone was intending to plant the back 40. Tufts had grown back, but just tufts… Oh, Alpine. Alpine is mistress of the imploring look. Everyone was mentally scattered by the heat, but it helped — or hurt? — when Brian made us Trader Vic’s-style Mai Tais, or at least as close as Brian could get given the substitutions made necessary by inadequate liquor and grocery stores. I’d never had a Mai Tai up until a few years ago, when horror writer Harry Squires — husband to romance writer Susan Squires — introduced us all to a devilish little tiki drink recipe book called Beachbum Berry Remixed. Oh, what demons he unleashed with that. I never thought I liked cocktails before Beachbum Berry came into my life, and never would have guessed I’d have such fun making them, and some of the hard-to-find ingredients that go into them, like falernum. The last several days had been depressingly void of rusty old auto parts for Clark, but over dinner Melanie and Brian told us about the boxes of tools they’d moved from their previous house. They’d been intending to haul them to Goodwill, but hadn’t gotten around to it; they were tools that had been hung on the walls of the garage in their old house by the previous owner, because he liked how they looked. They were art. Maybe Clark would like to go down to the storage area and see if there was anything he’d want? Tools, for free? Of course he’d like to go look! 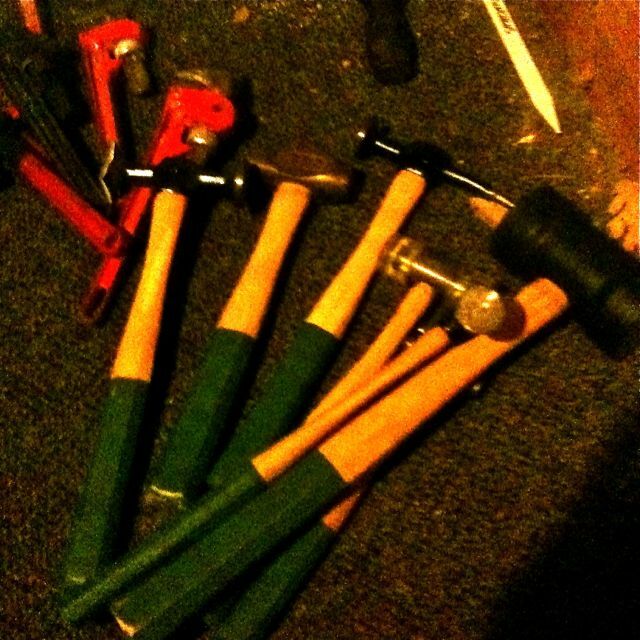 Proto body hammers, never used. Jackpot! Soon I was making my own happy noises, as Melanie had been cleaning out her closet, and had a rack of dresses and skirts waiting for me that she no longer wore. 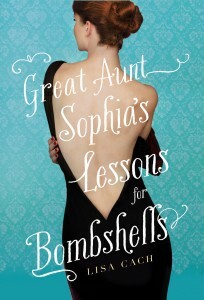 I should point out that Great-Aunt Sophia’s Lessons for Bombshells is dedicated to Melanie, as she got me to stop wearing baggy, frumpy dresses that made me look like I was Wife Number Sixteen at a polygamy compound, and into figure-flattering garments that forced me to show my shape. Tastefully, of course — we’re not talking cleavage to the navel here. By the way, for a humorous version of that original transformation, take a look here. Half an hour later I was three BCBG dresses to the better – including one of white suede that Wilma Flintstone could have worn – and ruined for dress shopping anywhere but in Melanie’s closet. In the meantime, Brian had been prodding Clark to email him Clark’s golf comedy and first novel, Winter Rules; Brian knew how to side-load it onto his Kindle, and wanted to read it. No one has read it yet but me and one other person, so Clark was reluctant. To put it mildly. “Filled with terror” might be more accurate. But Brian kept prodding (I think he learned imploring techniques from Alpine), so Clark, full of self-doubt as he was, sent it. Tomorrow, Brian has offered to make a book cover for Winter Rules.